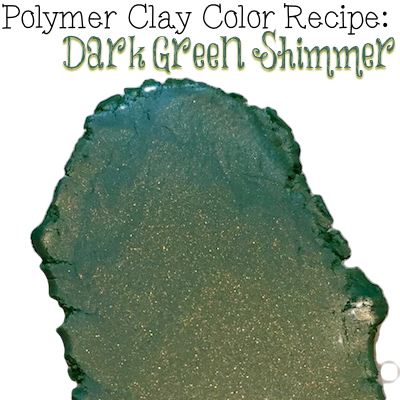 Dark Green Shimmer Premo Polymer Clay Color Recipe is reminiscent of Christmas, holly leaves, and the sparkle of a Christmas tree. I love green polymer clay, especially green polymer clay with a blue undertone. This metallic and luscious polymer clay will brighten up those dull greens! There are quite a few Premo! green polymer clays on the market: Green, Spanish Olive, Wasabi, & Jungle in the standard line. And in the Premo! Accents line there is: Bright Green Pearl. I find the green palette in the Premo line to be severely lacking and find myself consistently making my own greens. In fact, I’ve made several green color recipes for you here on the site for you to enjoy! If you are looking to make your own and don’t know how or don’t know where to begin, don’t look any further than this article on Making a Color Palette 101. And be sure you don’t miss any of my free color recipes by visiting here. Add 1/2 part additional Purple for more rich depth. Add 1/2 part more blue for a bluer undertone. Add 1 part more wasabi for a yellower green color. I love your clay recipes. Thank you for sharing. I wish you would include one photograph of something you have made with the color! I don’t always use these colors to “make” something. I often just make them for you, my darling readers, to use and enjoy.